Hard work doesn’t stop outside the classroom, especially for one group of students who sought to make a difference for those who may not always have a place to learn. 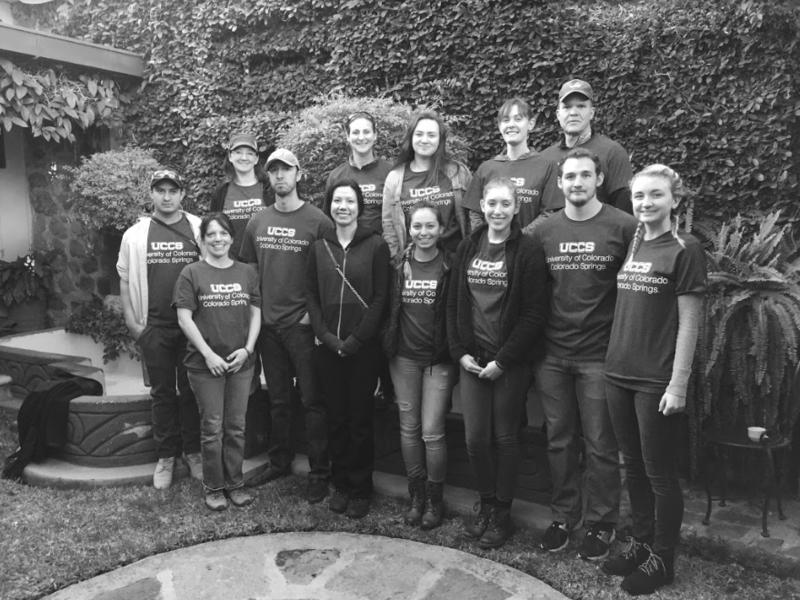 Students, including eight from UCCS and one from Colorado State University, laid concrete floors for a three-room school during the trip. The foundation, columns and beams of the school are composed of concrete and iron, according to Hug It Forward. Instead of cinder blocks or bricks, however, the walls are constructed with “eco-bricks” made of inorganic trash. Hug It Forward uses this technique so children in impoverished areas can be provided with a sheltered structure for education. About 10,000 bottles were used to build the school’s walls, according to senior biomedical science Mikayla McManimon-Garland, a student who attended the trip. “By the time we arrived, the walls had already been constructed. Our job, with the help of a few members of Hug It Forward and the men of the Caliaj community, was to lay the cement flooring for each of the rooms and the sidewalk around the building,” she says. Junior biomedical science major Garrett Groener believes that this strategy also helps keep communities clean. The group stayed in hotels in both Tecpán and in Antigua and traveled to Caliaj for service. They spent much of the time mixing cement with shovels. McManimon-Garland says that although the work was hard, the final result was rewarding. “Being able to assist in building a school for them was hard work, but I hope those children are able to continue to grow and learn with our support,” she says. According to McManimon-Garland, the service group was also able to closely interact with community members and learn more about their culture. “Our ultimate goal was to help build this school in this community and to learn about the culture in the country. We also played with the school kids we worked hard and learned about the culture through stories from the community members,” McManimon-Garland says. One of Groener’s takeaways was to enjoy life no matter what, he says. “We went there with a goal to help them and to help build schools but in the end, they taught us more than we could ever teach them. They taught us to be kind to everyone to enjoy life no matter what and to make the best out of what you have,” says Groener.